Tai Chi is a Chinese martial art that is primarily practiced for its health benefits, including a means for dealing with tension and stress. Among the martial arts, there are two basic types: the hard martial arts and the soft martial arts. The latter are also called internal martial arts. Examples of the soft martial arts are Ba Gua and Tai Chi. Tai Chi emphasizes complete relaxation, and is essentially a form of meditation or what has been called “meditation in motion.” Unlike the hard martial arts, Tai Chi is characterized by soft, slow, flowing movements that emphasize force, rather than brute strength. Though it is soft, slow, and flowing, the movements are executed precisely. In watching the circular movements of Tai Chi, one can see the entire body is involved. Each joint is exercised within its range of motion, and each muscle is exercised and stretched. Many participants in our class report their balance has improved significantly along with increased flexibility and overall strength. “The Human frame is phenomenally unstable”, explains Robert Whipple, an expert on balance and gait at the University of Connecticut School of Medicine. 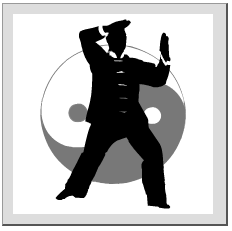 Tai Chi has come up with the best possible biomechanical scenarios for keeping a person stable- to maximize your standing base by widening your stance, and to keep your head and torso as vertical as possible. Several studies have focused on Tai Chi’s benefits for people above 50 years- specifically noting its positive effects on posture, strength and balance- skills that deteriorate over time. This deterioration, with loss of balance and flexibility, account for an astonishingly high incidence of falls in seniors. At least 70% of emergency room visits by people over the age of 75 are for fall-related injuries and subsequent health problems. It has been studied that elders that have more difficulty standing upright may unconsciously compensate by stiffening their muscles, and that may make them more likely to fall and injure themselves when they do. Tai Chi can train the body’s memory and teach the muscles when to work and how much. It distributes the work among the different muscles. You learn how to align the bones. You create stronger roots, a stronger base. In recent studies, the Arthritis Foundation has published various articles pertaining to musculoskeletal conditions. These studies have concluded that the practice of Tai Chi has benefited its practitioners in many ways. One study concluded that Tai Chi reduces pain through the focus on breathing and flowing gestures. The increase of muscle strength and balance gives general pain relief by taking stress off the joints. Also, stress and pain are related, Tai Chi and Meditation relieve stress, therefore relieving pain.